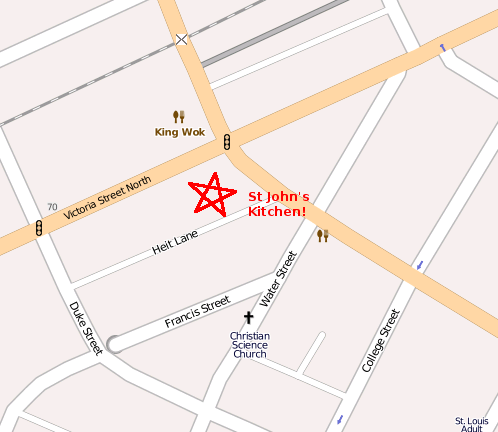 St. John's Kitchen is near the corner of Victoria and Weber streets in Kitchener. Here is 97 Victoria Street North on OpenStreetMap! When viewing the building from Victoria Street, the entrance to St. John's Kitchen is on the left hand side. 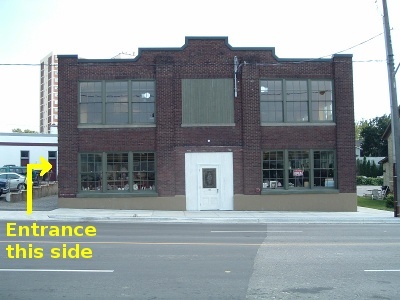 The meeting area is on the second floor of the building. There is lots of bike parking. There is a pay lot at the VIA train station diagnonally across from St John's Kitchen, and more pay parking on Water Street. There is also a transit stop on Weber Street, but it is only serviced by GRT bus #18. The site is not too far (maybe 10-15 minutes walking) from Victoria and King (which is serviced by the #7) or even the Kitchener transit terminal. 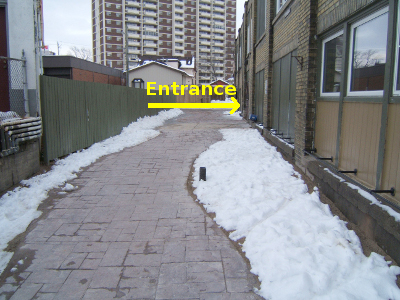 In terms of accessibility: there are some stairs, but elevator access to get up to the second floor is available. The elevator does require an operator with a key, so it is best to arrange for elevator access beforehand if possible. There are wheelchair-sized bathroom stalls, but the washroom basins are not necessarily wheelchair-friendly. Unless otherwise announced, meetings start at 7pm. Doors open around 6:30pm. We are not allowed to leave the doors unlocked all evening at this location, so please try to be prompt. If you come late then you will still be able to come in; there will be a sign with instructions on the door. Bring a cellphone if you have one. These are the most active social presences. Others are listed on the community page.